Well, it’s been been a while since I seriously blogged anything. I have had a crazy month. I am working for GMP the Churches of Christ missions group for 2 days a week. This group is trying to go through major change and restructure. As to the success of this change or even if the group embrace the full picture the suggestions entail we will wait and see. I went to Adelaide (Head office) for some meetings over the weekend of 14 – 16 Sept. It was short and sweet. I had a week at home before a quick wedding rehearsal on the Saturday and flew out to Sydney on the Sunday to spend a few hours at the ACOM retreat en-route to Queensland for National Youth Ministry Convention. I flew with Mark O’Brien of Lowercase fame. We chatted extensively about the ‘biblocentricity’ (love that word? I think I just made it up…not sure) of our Joondalup thing. A conversation coming out of a long discussion on his blog. 1) What we are doing is different and challenges some of the ‘come and see’ models of church. We are a church that is low on ‘event’ and high on ‘just live it out’. If you hang out with our crew, intersect with out group’s web of relationships, you have ‘come to our church’. 2) What we are doing does indeed lack some sense of biblical missional/evangelical type drive that seems to be present in the New Testament from my (and Mark’s reading). It also lacks, as I have always felt, a common set of beliefs. 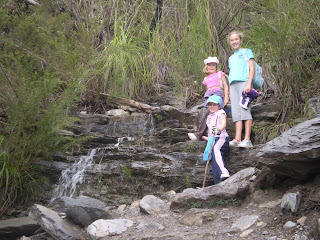 Anyway, we chatted lots, not just about that, but lots of stuff, all the way to Stanwell Park in the south of Sydney. Caught up with Neale Meredith that night and all the ACOM crew the next morning before heading back to the airport for a 3pm flight to Coolangatta. I checked into my flash hotel (Watermark) right on the Gold Coast, managed to wangle a free room for the week! Nothing like saving money for Youth Vision! We had dinner on the beach with most of the WA crew that night, nice. Wednesday saw the start of the NYMC proper. Tim Hawkins jumped in as main speaker #1. He is probably Australia’s premier youth pastor. Brenton Killeen and I had the privilege of being MCs at the conference so we had the chance to banter a bit with the speakers and get to know them a little, this was great stuff. Duffy Robins spoke that evening and Tony Campolo the next day morning and night. I lead an open space technology session on Thursday on youth ministry issues which was fun. Friday I headed to the Sunshine Coast for the day and evening with Gary, a great mate. He and I have become friends through working with ACOM together, but as our lives (our ACOM lives) have gone separate ways, we have retained some contact, mainly through blogging really. We have some differences of belief and understanding about who God is and the way he works, and we have some deep similarities about the way we think about the earth, family, peace and lifestyle…and red wine, Guinness and cigars! I enjoyed a relaxing day with Gary and his amazing family, Catherine, Christopher and Tamara Gary’s great wife. I got on particularly well with Christopher their 11 year old, he and I have some common interests; 4WD videos, the bush, naughty jokes, and identifying cars a long way off!! He is a champ! Gary has a great little electric scooter, it only does about 60km/h and only travels about 50km before needing a recharge but is great for around their area, just ducking to the shops etc. It is completely silent but for the wheels on the road, felt odd! Sadly I said goodbye and headed to the airport after a great night’s sleep in their guest house in the forest. A long day traveling took me, 2 hours on a freeway, 2 hours to Melbourne, 3 hours to Perth and finally in my own bed! Sun 30th Sept is Animal Sunday according to the new insert into the traditional church calendar “A Season of Creation”. So we celebrated this day as a church out at Landsdale Farm. We explored what, at the farm, stood out and made us this of God the Creator. 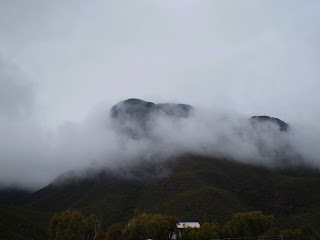 It was a great sitting together on the lawn surrounded by goats, sheep, horses, pigs and rabbits discussing our creator. I did a wedding in the afternoon…a 15 minute service, almost my shortest on record…one I did was 11 minutes long!! Hey, there is only so much you can add to a wedding in which the couple don’t want too much at all! The next day was a public holiday, our whole extended family went to Super Golf in the Swan Valley and then for a picnic lunch. A great day was had by all, Super Golf is worth the effort. Tuesday2 Oct saw me back up in Lesmurdie for another day of “Life Skills” with Roger tan and the Churches of Christ crew, not bad stuff, good PD. 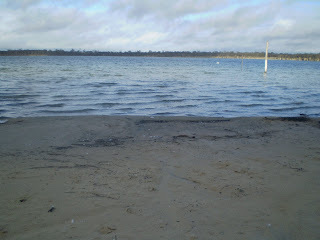 Trip to Northam Thursday for a meeting about an outreach we are doing their next year. We met in the old hospital which is slowly being transformed into a conference centre of sorts…long road ahead!! Sunday – preached at Busselton Church of Christ, good crew there. I caught up with Greg, who thinks a bit like me in terms of Church. He has done some Forge units and indicated maybe I would be a good fit for the Senior Pastor’s job going there… hmmm I love the church, Greg seems great, we do think a like, I would love to go country one day, but for now I think we are where God wants us. I do often wonder how I would fit into an ‘normal’ church these days. I entertain the thought from time to time! I caught up with some of their new youth leadership team, a great bunch of young adults willing to make something happen for their High School Youth Min. I think something great could happen there! Sunday night dinner with Dave Cohen from Dunsborough along with Gavin R my long time mate. Gav is a Dr in Busso, Dave the Pastor at one of the Dunsborough Churches. Great night of chatting until the kids were ready to move, could have talked all night with these guys…Gav and I eventually did!! They have just built THE most amazing house on the bank of the Blackwood river. 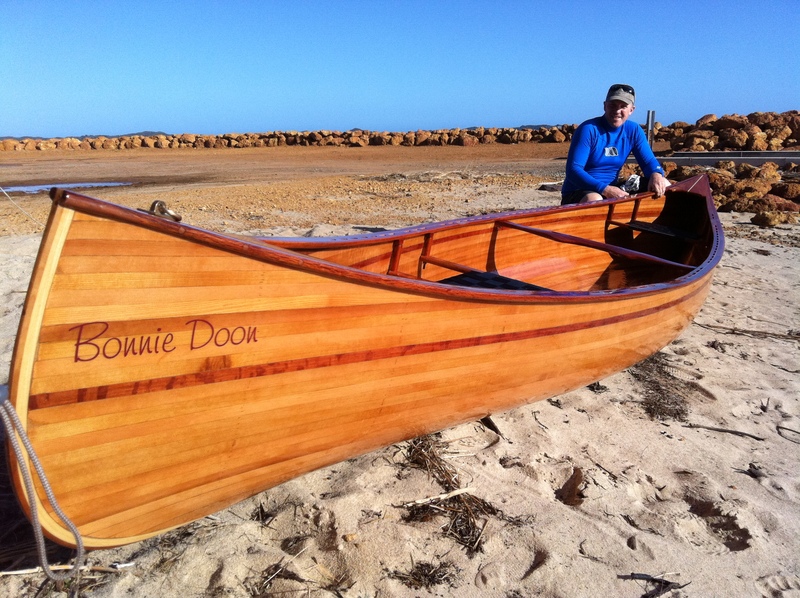 He has done the rammed earth himself as well as most of the timber…in fact it has almost been all done by Steve. These guys are great and are doing brilliant work with young people in and around the South West. On to Bridgetown…a big contrast to our Rivers Church (pentecostal)!! Bridgetown is typical of most small country churches. We met in the pastors house, a very traditional looking country conservative pastors house with morning tea laid out on the table in the dining room and all the chairs set in a circle ready for our meeting of key members of the church to discuss youth and children’s issues in the church and town. They were a really wonderful bunch of people with a passion God and for their town, a stunning town I could really live in, seriously this place is a picture. 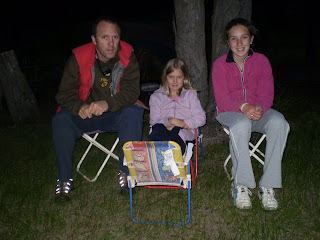 The kids and I camped out next to a beautiful lake not far from the little town of Franklin. Nice break in the rain for our camp, even when it did rain we had a picnic shelter under which we pitched the tent and swag. Tuesday saw an early visit to the Mt Barker bakery to pick up a nice bun before dropping in to visit Paul and Deb Ritchie. Deb was a ‘Michaels’, a kind of relative of mine in a round about way! These guys are champs, seriously they have a house full of kids on Wednesdays after school for homework club, fun, games and dinner, they deserve a medal! 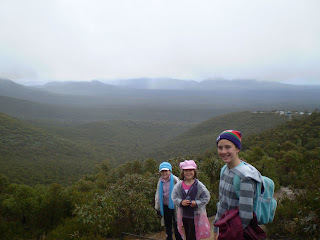 After almost a half a day at their house me and the kids drove to the Stirling Ranges, my favorite spot in the world…ok Tasmania is but the Stirls comes in close. 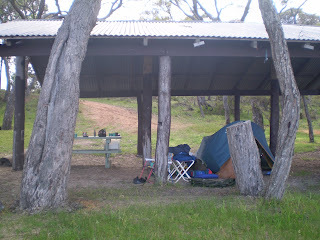 With so much rain around we took a cabin…cheats!! 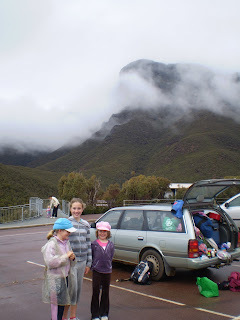 We headed up to a cloud covered Bluff Knoll first thing the next morning the kids did brilliant, they climbed all the way to the top with no complaints. Even Amy after falling and giving her knee a big whack got up and made it to the top and back. Girls going to wee in the bush is not an issue I have experience in! I found myself pondering ways in which to invent some pipe system in which to simulate the same ‘system’ boys have…ok, I didn’t spend a long time thinking about this, but seriously, there has to be a better way girls! 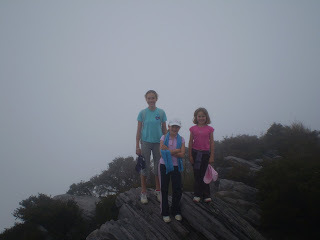 On top of Bluff, we did not see much at all, the cloud was too thick, but the buzz of being on the top was brilliant. I took some video on my phone, see below. The girls made lots of crazy video once they discovered how to use the phone video thing, see here. We headed home in time for Church last night, a great few days of combined ministry/life/family/work/play/recreation/mission/whatever you call it…it was fun! lots of stuff going on mate, wow! Bummed i didn’t get to catch up while you were in Qld. Next time hopefully. Or maybe I’ll have to make my way over to WA. It was an absolute delight to have you visit us in our space here old mate! I have learned it is smart to love anyone my kids love and they certainly took to you, so I must have been right about you! Also the long chat with you over port and cigars was choice. You listen and reflect in such a way that people tend to be honest with you. Now, what was it I said to you?? ?